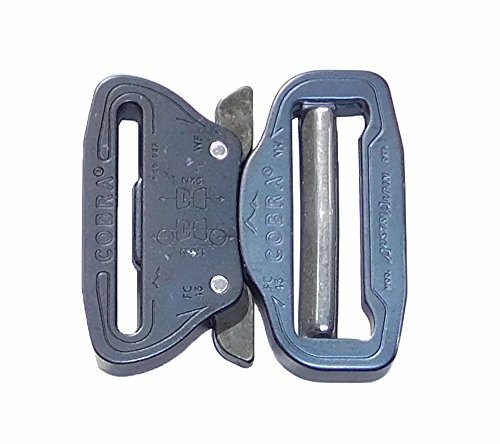 AustriAlpin Alloy Cobra Buckle FC45MVF-XB 1.75 in. (45mm) Male Adjustable, Matte Black, Extra-Large Ears by Austrialpin at Kerinci. MPN: FC45MVF-XB. Hurry! Limited time offer. Offer valid only while supplies last. Patented AustriAlpin COBRA quick releases are, without equal, the safest, most finely crafted, and strongest load bearing buckles available anywhere. Patented AustriAlpin COBRA quick releases are, without equal, the safest, most finely crafted, and strongest load bearing buckles available anywhere. They are also the only stab-lock style fastener in the safety products market that will not open while under load. That makes them the best choice (we believe, the only choice) for ensuring the highest degree of safety for yourself or your customer. COBRAs are CNC machined, assembled, inspected, and packed (re: from alpha to omega) in an ISO quality assurance accredited facility. All COBRA products are tested and certified by highly respected independent 3rd party test houses and exceed Mil Spec guidelines for dust, sand, and salt water as well as all applicable CE, EN, CSA, ANSI, and NFPA standards for fall-protection and personal safety. All COBRAs are machined from the highest grade 7075 aluminum alloy and feature solid brass and stainless steel components. Each production batch is randomly test certified for strength. COBRAs are used in countless Military applications/contracts (with Berry Amendment approval). They are specified over and over again for special contracts and applications where uncompromising safety, long term reliability, and extreme performance are required. Finish: Matte Black; Weight: 2.5 oz. ; Overall Dimensions: 2-13/16 in. x 2-1/4 in. x 3/8 in. View More In Backpack Accessories. If you have any questions about this product by Austrialpin, contact us by completing and submitting the form below. If you are looking for a specif part number, please include it with your message.